With the increasing number of aircraft passengers every year, Indonesian airlines also plan to increase their fleets, but this is expected to create a shortage of human resources, particularly pilots, a Transportation Ministry senior official says. “Generally, with the current growth in passenger numbers for air transportation reaching 15 percent every year, there is a wide gap in the availability of local pilots,” Air Transportation Director General - Heri Bhakti said Thursday. Heri was talking on the sidelines of the Indonesian National Air Carriers Association (Inaca) general meeting in Jakarta. He added that in 2010 there were around 51.7 million passengers on domestic flights, an increase of 18 percent over the 43.8 million recorded in 2009. The association also saw an increase in international routes that recorded 6.6 million passengers in 2010, far more than the 5 million passengers in 2009.
local aviation schools only amounted to around 200 to 300 people a year. “And they cannot fly planes immediately after they graduate. They must at least become copilot candidates, copilots and then captains, which takes at least a year or up to 3,000 flying hours,” Hari said. 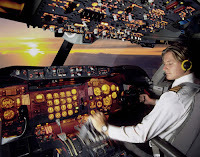 By the middle of 2011, there were around 7,000 pilots working for Indonesian airlines, 300 of them foreign.